When trying to relate building with LEGO bricks as a hobby or obsession to people, I'll often draw the comparison to somebody who spends most weekend afternoons or weekday nights in their garage working on a classic car. But there's no reason that the two have to be mutually exclusive. 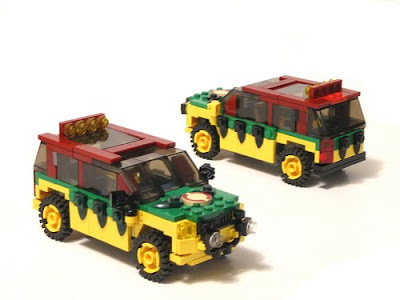 If you're a car nut and a LEGO nut -- you might as well design some sweet rides, even if you can't get behind the wheel. Jalopnik has a quick profile and lots of photos from Finnish builder Johannes Rojola, who has managed to build a Vanagon, station wagon, and nearly every meaningful American muscle car from the past half-century. When you're ready to fully dive in to the world of LEGO cars, visit LUGNuts -- an online collection of car builders that regularly feature drool-worthy hot rods. If you prefer your models moving, here's a 2006 video of a robotic LEGO car that can self-park.